Folic acid is an important supplement that helps the body function properly. It is naturally available in many foods and most people can get adequate doses without a supplement. 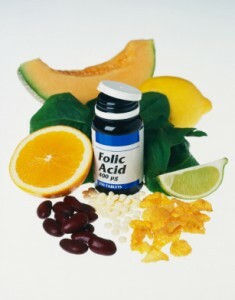 Taking a folic acid supplement or getting folic acid in a multivitamin is generally safe. Folic acid side effects are so rare that you should talk to your doctor any time you experience them. Since these side effects are so rare, you should contact your doctor if you experience any of the above. Though the side effects themselves may not be dangerous, they are an indication that you are consuming too much of this vitamin. Your supplements should be changed to a dosage that is more appropriate for your needs. Patients who take high doses of folic acid over a long period of time are at risk for extremely serious side effects. Some studies now show that a long history of taking large amounts of folic acid can lead to an increased risk of heart attacks in individuals with heart disease. Folic acid in high doses may also increase your risk of developing cancer, particularly in individuals who have already had some type of cancer. Always consult your doctor before taking more than the recommended daily dose of 400 mcg. Some individuals can experience an allergic reaction to folic acid supplements. Folic acid supplements come in many different forms and the ingredients from one to another can vary. If you experience any of the following side effects, you may be experiencing a severe allergic reaction and you should contact your healthcare provider immediately. Seizures are one of the rare side effects that may occur. These are particularly common in patients who have a history of epilepsy. If you experience seizures of any kind while taking folic acid, you should consult your healthcare provider immediately. If you have a history of seizures, you should not take more than 400 mg of this vitamin each day unless otherwise advised by a healthcare professional. Folic acid side effects are so rare that this is almost always a safe supplement to add to your diet. In the rare cases where you believe you are experiencing adverse side effects of folic acid, you should contact your doctor to make sure you have correctly identified the cause and to explore other options for getting the nutrients your body needs to stay healthy.